UKIP say they would cut net migration levels to zero within five years by almost halving immigration into the UK. They want to align the number of people coming to the UK - 596,000 in the year to last September - with those leaving, which was 323,000 over the same period. Unskilled and low-skilled labour would be banned for five years while skilled workers and students would need visas. Party leader Paul Nuttall said the "radical" plan would put "clear water" between it and the Conservatives. It comes amid signs that Theresa May will retain a controversial target to reduce levels of net migration - which totalled 273,000 in the last recorded figures - to the tens of thousands in her party's manifesto. Reality Check: Could UKIP's immigration policy work? How do students affect migration stats? The target, first set by David Cameron in the run-up to the 2010 election and criticised by business, has been repeatedly missed since then but the prime minister said it was still important to continue to aim for "sustainable" levels. Net migration is the difference between the numbers of people moving to the UK for more than a year, and the numbers of people leaving the UK to live elsewhere for a year or more. UKIP, which is seeking to bounce back from a poor set of local election results, said the Conservatives could not be trusted over the issue and only it had the "political will" to bring about a sizeable reduction in immigration, before and after the UK leaves the European Union. Announcing its policy for June's general election, immigration spokesman John Bickley said England was the "sixth most overcrowded country in the world", with immigration levels putting pressure on public services and community cohesion and depressing wage levels for British workers. The number of workers, students and family members given visas would be determined by an Australian-style points system while the whole system would be overseen by a new Migration Control Commission. Even though the free movement of EU workers will still apply until Brexit, expected to happen in 2019, and the common travel area with the Republic of Ireland is expected to be maintained, UKIP believes it can bring net migration into balance within five years. Although it will not set annual targets, it is committed to then keeping the average figure at zero over a rolling five year period. 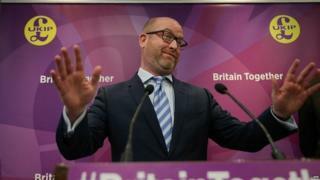 "Net migration has been the equivalent of a city the size of Birmingham over the past three years," Mr Nuttall said. "This is clearly unsustainable and it is clearly unfair, particularly to inner city communities." Of the 596,000 people who came to the UK in the last year, 268,000 were from the EU while 257,000 were from elsewhere in the world, with the remaining 71,000 being British citizens returning. At the same time, 323,000 people left the UK. Mr Bickley said UKIP still wanted to attract the "brightest and best" to the UK, including foreign students, but there could not be an unlimited number of people coming to study due to the pressures it placed on housing and other infrastructure. He said the number of visas for seasonal workers from abroad would be gradually reduced as British workers were trained to take their places. "There used to be a time when it was a rite of passage that people going through, if you like, an internal gap year in this country... that to get some extra cash... they'd go fruit picking," he added. General election 2017: Could UKIP's immigration policy work?